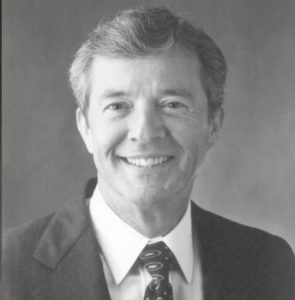 During his 26 years in the home building industry in California, William H. McFarland has influenced the construction of more than 40,000 homes and apartments. They range from La Jolla Colony in San Diego north to Vista Bahia in Marin County. Many of those homes and apartments have been located in the master-planned communities on the Irvine Ranch in Orange County which has won industry praise and national awards. The Irvine Village of Woodbridge won the 1994 Urban Land Institute national award as The Best Large Scale Residential Community in the United States. Bill oversaw the community development of the lrvine Ranch Village of Northwood, Westpart and the Tustin Ranch. In addition, Bill's fine touch can be seen as The Irvine Company's crown jewel --the Newport Coast Resort Community along the Pacific between Laguna Beach and Newport Beach. Bill is known to his professional associates as a soft-spoken effective leader and a rock solid businessman who has been a pioneer in master-planned residential community development. Throughout his building career, Bill has been active in both the Building Industry Association and the Urban Land Institute. ​To his friends, Bill is known as a devoted husband, family man, and avid tennis player. Bill and his wife, Romy have three children and live in Newport Beach.